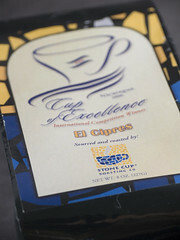 There’s been a lot of talk around me about [Stone Cup Roasting Co.](http://www.stonecup.com/) out of Chattanooga. Run by an impassioned Jennifer Stone I was going to meet her this past week but scheduling conflicts are going to keep us apart for a while longer. From what I understand she’s working on some farm programs, good brokers, recently reconditioned a beautiful German Gothot roaster from the 50’s….and she brew’s a mean stout? Oh I had to learn more and try some goodies. 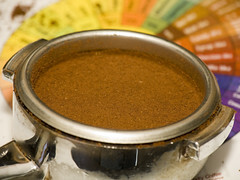 I placed a quick order of their Espresso Blend, Nicaraguan Cup of Excellence ‘El Cipres’, and the Mexico Pluma de Oro. It was a very difficult selection. Even more difficult has been to get me to distill my thoughts. I’m not really keen on compiling this all at once but theres something to be said for consolidation. Over a period of two weeks I drank a lot of coffee, and it was good. It even got better. I like it when that happens. Pulled at a floating 202’f, amazingly bitter free. I sampled again.. where is that *clickclick..* back of the throat up tick you generally get. It wasn’t there. Overall through my samplings it has rarely shown up to the party. 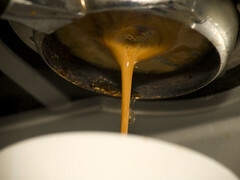 This is a very smooth espresso. I get images of cigar smoke.. smooth, silky, sultry..
* Hung around then left without telling. I had heard about the Ruiz farm through Intelly last year and was curious to see them when the farm popped up here. I had no expectations but was very pleased. A lot of clean Nicaraguan traits assembled into a classic profile. Goes great w/ a little milk, smooths down the serious brightness. 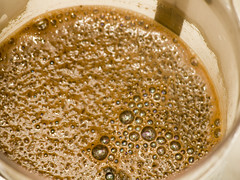 This coffee was our morning staple and it was nice. Comfortable, smooth, dry cocoa powder.. I hate to say it had a Mexican terroir so take that with what you will. Over time it got a heavier body and w/ milk & some sugar I’d have thoughts of hot-cocoa. 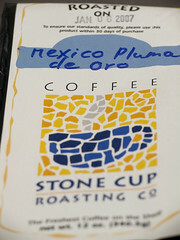 [Stone Cup Roasting Co.](http://www.stonecup.com/) is doing an admirable job and I look forward to seeing them grow. If there other products are as good as what I’ve tried then they are right on the money. Roasters, like any other group that deals with mother nature has their work cut out for them. Making and delivering a product that hits home every day is tricky and my hats off to those who take up the profession. Stone Cup is making great ties and doing the right things. I hope to learn more about them in the coming months since they are right over the hills east of us and I hear making some in-roads into the Charlotte area.